Environmentalist, journalist and author, Dave Hansford was recently awarded a Queen’s Service Medal for services to the environment. His recent book, Protecting Paradise, examines the debates surrounding the use of 1080 in New Zealand, and makes the case for urgent intervention to rescue dwindling native wildlife. Laura Keown sat down with him at Forest & Bird’s national office in Wellington to to chat about why some people fear 1080, and how a shared vision for the future of New Zealand’s biodiversity can bring people together. L: To kick things off, what is your name and what do you do? D: Sure. Well, I’m Dave Hansford and I’m a freelance writer. And I’ve been reporting on science and environment now for the last 15, 20 years, after a career in journalism. L: Thanks Dave. What do people fear most about 1080 do you think? L: Yeah, what’s the fear, what’s the source of that? D: I think if you analyse any feelings of fear, it’s so often about the unknown. I think people fear that which they don’t understand. And so if the book has any value to add it might help them to understand more about the science and chemistry of 1080. I think they’re fearful – if they are fearful – because they’ve heard an awful lot of that quite inflammatory, anti-science rhetoric around what 1080 is supposed to do. They’ve probably heard that it gets into waterways and poisons people’s water supplies. They’ve probably heard that it affects the unborn. They’ve heard that it kills everything in the forest, for instance. Well, of course all of these things are manifestly untrue. But they are very, very pervasive and persistent myths that just won’t seem to lie down. L: Why do you think they won’t lay down? When there’s evidence to the contrary, why doesn’t it stick? D: There’s a number of reasons why. So, some people prefer to invest their faith or their belief in a mythology they feel like they can understand, as opposed to empirical evidence that they don’t understand. They’re more comfortable framing these kinds of things in terms that they can grasp. And very often the mythology around 1080, the false claims, are made in very, very simplistic terms, which will appeal to people if they don’t have much of a scientific understanding. The other reason that these myths tend to stick around is because, frankly, it’s in the interests of some people to keep on putting them out there. Now there are those people, for instance in the hunting community, who feel like they have a right to deer, that they are the only people with a right to kill deer, and they object to 1080 because they feel like 1080 is killing their deer. So, a lot of anti-1080 rhetoric often comes from those elements of the hunting community. It’s worth noting too that some of the most prominent and outspoken opponents of 1080 actually have a vested commercial interest in seeing it stopped. So I’m talking about people for instance who run possum fur produce shops, outlets. People who for instance, who run a venison pet food business. Other people are hunting guides. So sometimes that opposition is motivated from a commercial standpoint as well. L: As a journalist, as an independent person, what do you see when you go out and observe the effects of 1080? Positive and negative, what are the effects? D: So, when I researched the book I went out on an aerial 1080 operation in the Coromandel and I made a point of sticking around for a week afterwards and I went back into the bush, into that drop zone, day-in day-out, for the next few days. I went looking for all these cases of dead birds that I had heard about. And I never found any. So, I was never able to substantiate these claims that people make, that 1080 is suppose to be killing so many native birds. I have simply found no evidence for that. I also went looking for 1080 baits in water and I did find those. And the reason I found those is because DOC was specifically granted permission by the medical officer of health to drop baits in that water. And that sounds appalling if you don’t understand the chemistry and the science around what happens to 1080 in water. And the authorities knew perfectly well that by the time those baits had sat in that stream for any more than about eight hours, that all of that 1080 was gone. And at one point, I even made a point of scooping some water out of a stream, where I could see 1080 baits lying, and I took a drink of that water. And hey, I’m still here, right? L: What about for the birds? Have you observed an effect on what the outcomes have been in projects that spread 1080. D: I haven’t observed or quantified any measurable benefits myself because I’m not skilled to do that. But I have seen DOC’s pre and post monitoring, where they’ve done a great job of quantifying the breeding success and the chick survival of certain species after 1080 operation, and that evidence is incontrovertible. They’ve done a great job of monitoring, I think eight different species now, through two successive Battle for Our Birds campaigns. And that data is extremely persuasive. What we’re finding is that birds like rifleman are enjoying like a 30% surge in breeding productivity. That rock wren are doing the same thing. That weka get a boost, for instance, from 1080 drops. And of course we’ve got the results of Waitutu Forest of the kākā, you know, spectacular breeding success after a 1080 operation there. L: Okay, my last question is about solutions. What do you think the strategy should be going forward for bringing people together on conservation issues like this? D: I think we need, all of us, to start thinking about the vision of New Zealand biodiversity that we want. All we know for sure at the moment is that we are losing populations, and soon if we’re not careful, whole species are going to vanish, and Jan Wright has just done some really valuable work on the extent of that attrition at the moment. So we have an extremely unenviable record of species loss in New Zealand. Which, you know, we have a responsibility to stop if we have the power. And we do have the power. So I think the national conversation needs to be about, how do we value native biodiversity? And what are we prepared to do to hold-on to it for future generations? And so, that’s about coming up with a narrative if you like. And for me, that’s about those flocks of kākā coming back to Waitutu for instance. That’s about, maybe the possibility of future generations being able to walk into a bush reserve near them and hearing kokako. You know? Bringing species that have effectively been in exile on offshore islands, bringing them home again. You know? After 200 years. That kind of stuff. It’s very powerful and very persuasive. 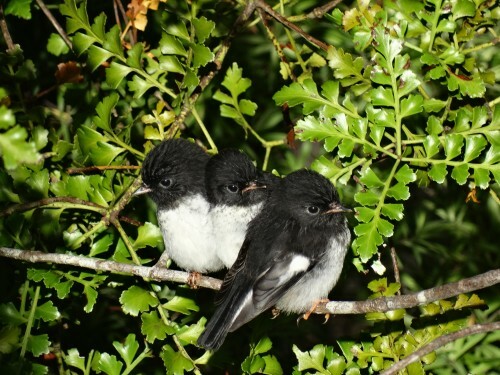 For more information about the use of 1080 in New Zealand, visit the 1080 Frequently Asked Questions page on the Forest & Bird website. Laura Keown has contributed 5 entries to our website, so far. View entries by Laura Keown. Time is running out for many of our iconic species. We must use all of the tools available to us to stop or slow this happening. There are some who will always be anti 1080 or anything else that could be used in the invasive species battle but, if we want to protect or flora and fauna, we have got to use it (1080). In the last month I have tramped in Te Urewera , Coromandel & Mt Taranaki bush. I have many friends who oppose aerial distribution of 1080. It’s not just Hunters . As a DOC contractor & resisident in a kiwi sanctury for 27 years I know the challenges we face. All of human beliefs have an emotional context & dropping any toxin from the sky that will poison wild animals who will die unpleasant deaths naturally does sit well with alot of people. When you take in the big picture & see how innocent & diverse our indigenes fauna & flora is the death of introduced species that destroy this rare treasure becomes vital. Due to the very poor PR which fed the negative stories around 1080 it is now very difficult to convince anyone to the contrary. Facts mean nothing. What needs to be explained is Ariel drops can stabilise remote areas enough to maintain with ground based work such as the amazing array of traps we now have. I agree with the article that we ALL need the big goal . Good journalism like this is a big help, thankyou.